The ‘Letter of Despair‘ trial – concerning a draft note (later typed) from a distraught Marilyn to Lee Strasberg during filming of Some Like it Hot in 1958 – reached its verdict on November 19, with a ruling against the plaintiff, Anna Strasberg, reports the Pasadena Star-News. 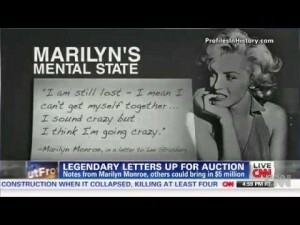 “A judge ruled on Wednesday that a handwritten letter by Marilyn Monroe in which she talked about the difficulties of performing before the camera belongs to a buyer who purchased it at auction at $130,000. Los Angeles Superior Court Judge Richard Fruin handed down his ruling in favor of Calabasas-based auction house Profiles in History and against 75-year-old Anna Strasberg, the widow of Lee Strasberg, who served for many years as Monroe’s mentor in her acting career. ‘Plaintiff has not proved by the civil standard that the letter was in the possession or owned by Ms. Strasberg,’ the judge said. Strasberg, who was married to Lee Strasberg from 1968 until his death in 1982, once served as administrator of the Monroe estate and has a large collection of the actress’ memorabilia. She sued Profiles in May 2013, saying she learned the month before, after a New York Post article about it was published, that the letter was missing from her collection. She said she inherited the writing from her late husband and alleged it was stolen. Profiles attorney Robert Enders maintained the letter was actually a draft version that was found by a housekeeper at the Hotel Bel-Air and it was never sent to Lee Strasberg. Fruin made multiple findings against Strasberg, including that she did not provide any inventory of Monroe items that included the letter and that there was no envelope showing the writing was sent to the acting pioneer husband. Had the letter been stolen from Strasberg as she alleged, he noted, it seems likely other items would have been taken as well. Although Strasberg claimed her husband showed her the letter in the late 1960s and that she saw it again in the period of 1988-92 when discussing it with her son, David Strasberg, her account was undercut by the fact her offspring testified he never saw the letter.